The focus of this year's natureplus general meeting will be the realignment of our association following the successful spin-off of the natureplus Institute SCE. Detailed information will be sent to the members in a personal invitation. Registration for the general meeting is now possible. 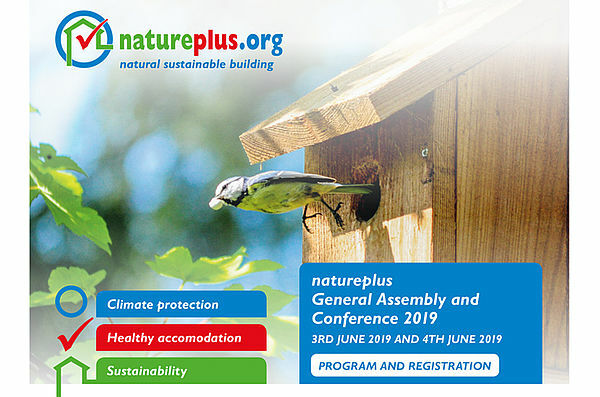 The traditionally following natureplus conference is embedded this year into the framework of the international congress Future of Building 2019 of the Austrian Federal Economic Chamber (WKO). The main topics of the lectures, podium discussions and innovation workshops will include wood & hybrid constructions, intelligent & environmentally friendly urban living concepts and digital building & twins. More information with natureplus recommended speakers, lectures and workshops you find in the Programme (PDF). the participation fee (if any) will be invoiced to you after registration by the natureplus representative of Austria - IBO - Österreichisches Institut für Baubiologie und -ökologie. The registration deadline is 29th May 2019. You can only cancel your registration free of charge by sending a written cancellation by 29th May 2019.